A huge fire tore through a South Korean hospital on Friday killing at least 41 people, reports said, in the country’s worst blaze for over a decade. More than 80 others were hurt in the blaze, which comes just weeks before thousands of athletes and foreign visitors are expected in the country for the Winter Olympics. 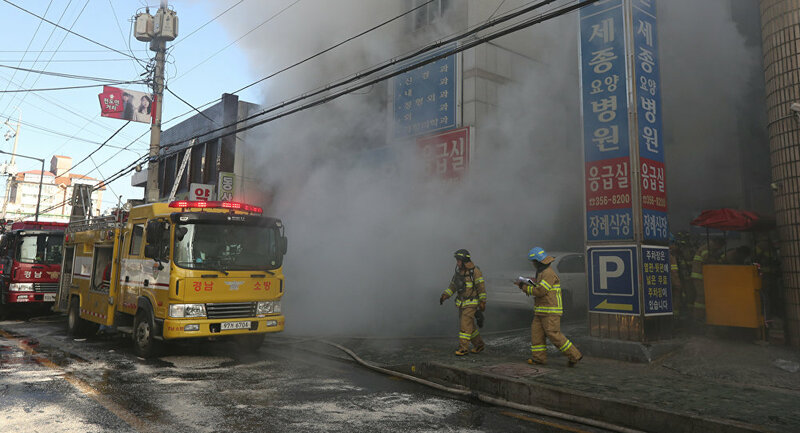 By lunchtime, it had hit 41, according to the Yonhap news agency, citing firefighters at the site. South Korean President Moon Jae-In called an emergency meeting with advisers and demanded an immediate probe into the cause of the blaze. The fire came only a month after 29 people were killed in an inferno at a fitness club in the South Korean city of Jecheon ─ a disaster blamed on insufficient emergency exits, flammable finishing materials and illegally parked cars blocking access to emergency vehicles. Friday’s accident is South Korea’s worst fire disaster for more than a decade after an arson attack on a subway station in the southeastern city of Daegu killed 192 in 2003.